Imagine this: You’ve just finished cutting and styling your client’s hair — she loves it! — and you’re ready to check out and take payment. After such a smooth appointment, there’s nothing more frustrating than a less-than-smooth checkout process. That’s why we recently integrated the Square Appointments app with a full point of sale and payments processing. And Square Appointments is now free for individuals. If you’re an individual, that means you just pay for payment processing — no subscription fee (until you bring on staff). Now you can manage appointments and take payments all in one place, saving time (while staying organized) and making your client’s experience that much more seamless. “Before Square Appointments, it took me five to six hours to get back to my clients. Now with online booking, it’s instant. And I can’t stress how easy it is,” said Pedro Dungo of Fittings by Pedro, a bike fitter in San Francisco. With payments integrated into the Appointments app, you have a full point-of-sale solution with integrated online scheduling, payment processing, inventory management, invoices, employee management, and more. You can see more customer information at a glance as well — everything from a customer’s appointment history and details to purchasing data. This means that every time your clients come in, you have a clear idea of all the services they’ve purchased before (and when), which allows you to provide a more customized experience. You can also see the status of each appointment in your calendar, including which appointments have already been checked out, so you can easily stay on top of your day and know the status of your calendar at a glance. Get Started with Square Appointments. Scheduling software that brings in more business. If you run any kind of appointments-based business, using software that integrates online scheduling with the rest of your business functions is key to staying organized, finding efficiencies, and providing the best customer experience. Our own data shows that Square Appointments can help businesses grow bookings, decrease cancellations, and increase the number of services booked by clients. “Everything else I tried before Square Appointments was far too complicated and cumbersome. Not only is Square Appointments easy and intuitive, but it’s everything I need in one roof and has actually improved my business. I’ve seen a raise in new and repeat business, but also fewer cancellations,” said Patrick Riley, owner of Barkbus, a mobile pet grooming business in Southern California. Free for individuals: Square Appointments is free for individuals, so you’ll have more money to spend on growing your business. And if you have employees, Square Appointments costs $50 per month for two to five employees and $90 per month for six to ten employees. Businesses with over 11 employees should contact Sales for custom pricing. The processing rate has also been updated from 2.75% to 2.5% + 10¢ per tap, dip, or swipe transaction. 24/7 online booking: 48 percent of appointments are booked during off hours, or after the business has closed. With Square Appointments, customers can book at their convenience, even if it’s after hours. Mobile booking: 80 percent of appointments are booked on mobile phones. 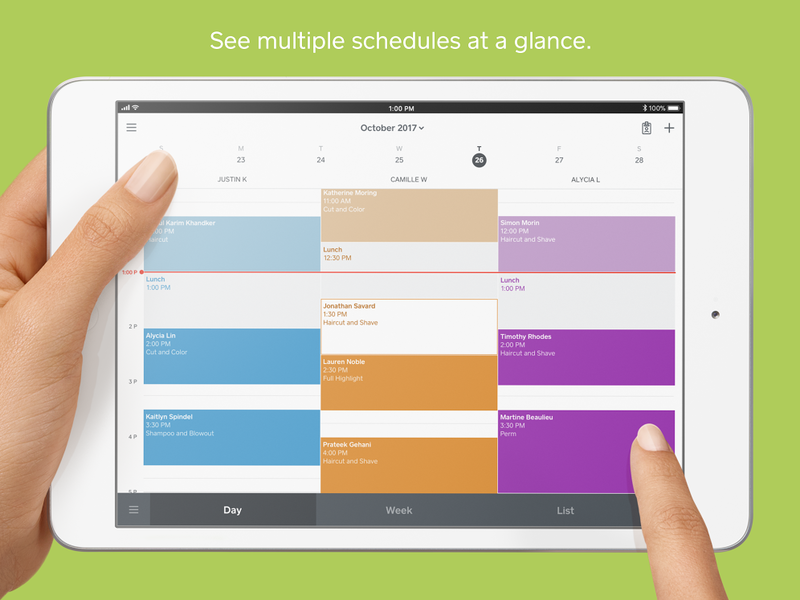 Square Appointments is available on any device, so you can provide a seamless booking experience, no matter what. All the features you love about Square Point of Sale, including integrated checkout, invoices, employee management, inventory management, and more. Prepayment to reduce no-shows: You can protect your time by requiring prepayment (or a credit card) to book online and setting a fee for missed appointments. This reduces cancellations and makes your calendar more efficient. Client reminders: If you want to reduce no-shows (or even just late clients), appointment reminders are another tool you should have. You can set text and email reminders to make sure clients always remember their appointment. Calendar sync: It’s a pain to jump back and forth between multiple calendars. Our online scheduling software syncs with Google Calendar so you and your clients can see your most up-to-date availability. Bring in more business with Square Appointments. Reduce no-shows, get free online booking, and integrate appointments with your payments.